Linda's Stampin Loft: Bugs and Kisses Anyone…. And happy Monday to everyone! I hope a great weekend was enjoyed by all. Ours certainly was great, but it’s here and gone before you know it! I really challenged myself with this card, BECAUSE….I have never done a card with all squares. I was like….Linda what were you thinking??? I felt like it took me forever, but at the end of the day it turned out okay. My Son-in-law is in the pest control business……guess what his card will be for his next birthday? …your right! I wanted each one to have a little something to stand out. Hence came the one leg on the grasshopper cut out and popped up, using the 1/2 circle punch I was able to punch the middle section out of the snail and pop it up, the caterpillar’s antenna was popped up and I gave them all black eyes of different sizes. Each scalloped square is also popped up using dimensionals. I used my Mat Pack to pierce the photo corners. And that’s sort of how my ‘square’ card went. You’ll have to leave me a comment and let me know what you think……did I pass? A BIGGIE for you all……..tomorrow is the Pals August Hop, you don’t want to miss it – theme is 3D! See you there! or go to www.PrintFriendly.com and enter the URL. Select PDF to automatically download this post to your computer. Linda I think its super cute. I wish I had gotten it, there were to many others to get, decisions, decisions!! I love how you added parts of the bug 3-d. This is adorable! Love how each little critter stands out ... so creative, Linda! Cute, cute card! Cute!!....cute!!....cute!! This card is just too adorable. Love how you made each bug stand out differently. This reminds me of all those years when we had grasshopper visits from this point in time until the freezing weather arrived. The squares are simply delightful, and the little guys are insectuous! Hello and thank you for stopping by my 'Stamping Loft'. I live in Maryland on the Delmarva Peninsula. I've been married for 34 short years we have 3 wonderful children, 2 fabulous grandchildren and 2 great yellow labs. Like most of you I am totally addicted to the world of stamping. 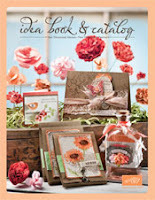 It all started a short time ago when I was introduced to Stampin' Up products. Wow! One stop shopping with a superb quality all of its own. I thoroughly enjoy all of blog land, appreciating all the labors of love; the talents shown by all of you is truly amazing. As a result I have decided to join in on the fun. In each post, I hope you will find a small bit of inspiration to keep your 'mojo' working.